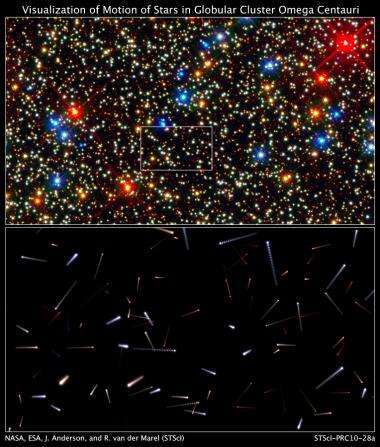 (PhysOrg.com) -- The globular star cluster Omega Centauri has caught the attention of sky watchers ever since the ancient astronomer Ptolemy first catalogued it 2,000 years ago. Ptolemy, however, thought Omega Centauri was a single star. He didn't know that the "star" was actually a beehive swarm of nearly 10 million stars, all orbiting a common center of gravity. To my eye, the video and the diagram seem to show every star traveling in a straight line, which is obviously not the case. What am I missing? And I don't think the central image in the video is an image of the cluster's "core," but rather an image looking straight through the cluster's core. Doesn't it also include stars from the close side of the cluster as well as the far side? These stars would be nowhere near the core. Foreground stars are recognizable by their distinct cross-like appearance. Background stars and galaxies would be moving too slowly compared to the stars in the central region of Omega Centauri to interfere with the observations. The stars may appear to be moving in straight lines but we are only looking at a 10,000yr period, not nearly enough to discern simple harmonic motion or arcs with the naked eye. Furthermore, it takes three points (observations) to define an arc. This simulation is based on only two. It doesn't take 3 points to define a delta in perceived motion of a point and extrapolate future posistion. Skeptic_Heretic: Actually simple analytic geometry. Three points will describe a curve that is second order (one maximum point) like an arc, which is simple calculus. More data points and the third dimension. It seems that they think that globular clusters are too old to be affected by gravity. Over the course of a very short time, the stars would likely appear to be traveling in a straight line. I am thinking that any orbit would have a very long radius and so not apparent in the very short term. I really don't understand why you gents are saying that there are only two reference points. This was done from multiple images of a 4 year period of time. There are detectable differences within a single month, let alone of the course of this period of time. They're not comparing 1 image from 04 and one from 06. They're comparing two sets of thousands of images. I really don't understand why you gents are saying that there are only two reference points. This was done from multiple images of a 4 year period of time...They're not comparing 1 image from 04 and one from 06. They're comparing two sets of thousands of images. I dunno, maybe I'm still reading it wrong, but to me that sounds like they took a set of images in 2002 and another set in 2006 and extrapolated, rather than taking continuous images from 2002 to 2006. Is a 'set' of images taken in one year considered a single data point (as a long exposure)? Is a 'set' of images taken in one year considered a single data point (as a long exposure)? It isn't a single long exposure from 02 and a single from 06. It is multiple exposures from 02 and multiple exposures from 06 that are used in the process. the only way to observe SHM is to have a refence frame on the order of or longer than the period, or frequency correct. Well we may not have made the observation on that order but we do know the center of gravity that they are all pinned to. so in effect they are travelling in huge elliptical orbits , (RIGHT?? I am thinking Kepplers equations here.. ) around this center of gravity. So unless they are as close to this center of gravity as say the outer boundry of the solar systems Oort Cloud your not going to see a star do a circle in that video.... furthermore it would be against reason to expect them to be packed so close otherwise they would be colliding all the time. You are correct in noting the stars in globular clusters are for the most part in elliptical orbits around the gravity well of a globular cluster. Orbital periods can be millions of years. "So unless they are as close to this center of gravity as say the outer boundry of the solar systems Oort Cloud your not going to see a star do a circle in that video..."
The main purpose of this study was to look for stellar motions that might be caused by an intermediate mass BH, similar (but not as extreme) to what we see in our galaxy with the SMBH Sag A*. A 2008 paper claimed there was evidence to infer the presence of a IMBH with a mass of 4 suns. This work found no evidence of such an object and put an upper mass limit at 1.2 Msun, only slightly larger than stellar mass BHs (this is the real story here). Again, details can be found in papers (I & II) in my link above. So cool - 10000 years in the future - but really its the past because of how long the light takes to reach us! OK, so they are not accounting for gravitational effects here. But this is a very, very awesome video. 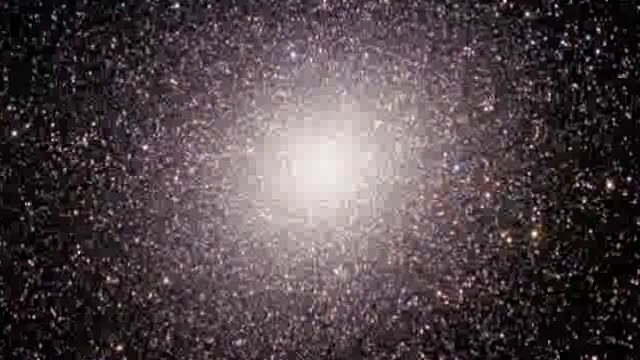 I have seen globular cluster many times in my telescope. But, until now, I have never conceptualized what it would look like with highly magnified pinpoint resolution, much less be able to conceive the "beehive"-like motion within. This is really astounding. Hubble is a jewel among human achievements. Can't wait for 22nd century astronomy! !